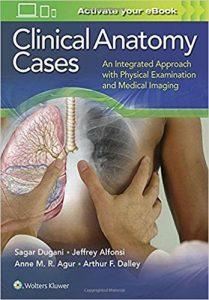 Clinical Anatomy Cases integrates anatomy, physical examination, and medical imaging into a single, practical resource—an ideal presentation for today’s students and residents. Carefully organized content presents normal, clinical, and radiologic anatomy, along with case examples, relevant physical examination information, and clinical pearls. Written and developed by students, residents, physicians, and instructors, Clinical Anatomy Cases is a valuable resource for coursework in medical, physician assistant, nurse practitioner, dental, physical therapy, occupational therapy, and other health programs as well as for board exam preparation and as an introduction to radiology during the transition to clinical rotations and practice. More than 80 clinical cases organized by region with corresponding systems overviews as well as typical lab tests, functional testing, and diagnostic imaging presenting full, integrated cases. A highly visual presentation with more than 320 illustrations, photographs, and images to lead students through normal anatomy and common clinical presentations and diseases. Specialty icons that identify case content for Family Medicine, Emergency Medicine, Obstetrics and Gynecology, Surgery, and Internal Medicine. Lists of differential diagnoses and high-yield clinical pearls that help students think through clinical scenarios. Co-authors of the best-selling anatomy textbooks Clinically Oriented Anatomy and Essential Clinical Anatomy.